Show Me The Movies: Review: Avengers: Infinity War - A visual feast to entertain the masses! Review: Avengers: Infinity War - A visual feast to entertain the masses! In this latest Marvel studios outing, Avengers: Infinity War brings to the screen the ultimate, deadliest showdown of all time. 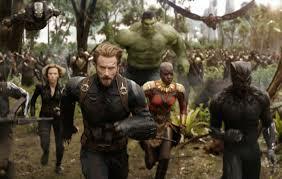 The Avengers and their allies must be willing to sacrifice everything in an attempt to defeat the all mighty Thanos before his onslaught of devastation and ruin puts an end to the universe. Eighteen marvel movies in and ten years in the making, Avengers:Infinity War was going to have to be something really special to surpass all the big budget, record breaking, jaw dropping spectacles that had gone before it and thankfully in the more than capable hands of Anthony and Joe Russo, what could have been a disaster (due to the vast size of the task being taken on! ), actually turns out to be a rather enjoyable two and half hour exhibition that is bound to have fans of the series grinning from ear to ear! Gathering an army of superheros, giving each one an arc in an epic storyline, creating visual pieces of unprecedented proportions and wrapping it all up in a 150 minute production can be a very problematic and risky feat (just ask those behind the recent Justice League movie!) but somehow in this instance the Russo brothers just about manage to pull it off. Avengers:Infinity War should come with a hazardous warning however, knowledge and familiarity with the eighteen previous Marvel Studios films whereas not a necessity, will undoubtedly make this a more enjoyable experience. Packed with twists and turns that justified the code of silence that hung over production since the beginning, the script is filled with witty one-liners, the action sequences are incredible and the performances are rock solid - all qualities that have become the staple diet of Marvel Studios movies over the last decade. Whilst, this particular superhero feature may be that half hour too long (aren't they all?) there is more than enough to keep the huge crowds that will inevitably see this movie thrilled throughout!